What Does Cherry Angioma Look Like? Following article will help you to decide if Cherry Angioma removal is for you. A Cherry Angioma is a bright Red, of a circular or oval shape. It is relatively small ranging in size from a pinpoint to one-fourth of an inch in diameter. 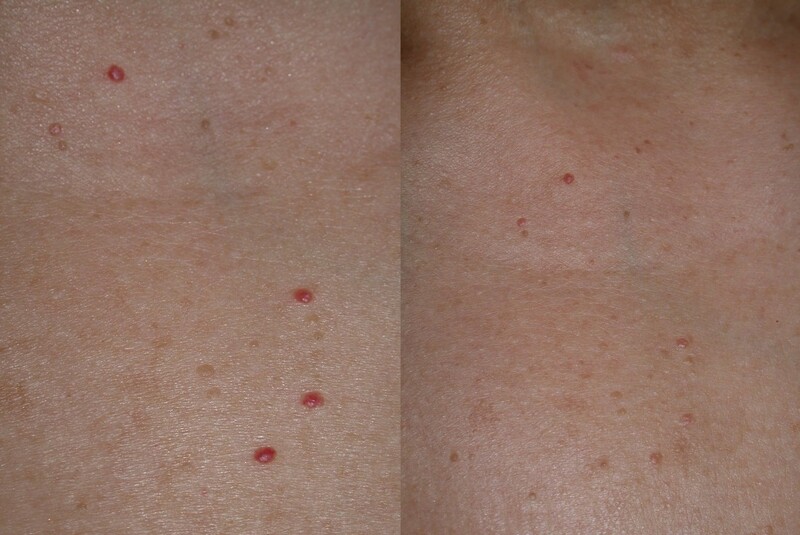 Some cherry Angioma appear smooth and even with your skin, while others appear slightly raised. They most often grow on the torso, arms, and shoulders. Bleeding can occur if the Cherry Angioma is scratched, rubbed, or cut open. It is a good idea to look for Cherry Angioma removal if this occurs. Cherry Angioma Removal, The cause of Cherry Angioma is unknown, there may be a genetic factors that make certain people more likely to get this skin defect. They have also been linked to age, pregnancy, exposure to chemicals, and various climate factors. When to Seek Medical Cherry Angioma removal? Besides the way this skin defect looks, this type of skin growth typically is not a big cause for concern unless it bleeds often or changes in size, shape, or color. Make an appointment with Allura for Cherry Angioma Removal. It is important to have any type of lesion or growth looked at when its appearance changes so that doctor can rule out serious conditions, such as skin cancer. Shave excision, Cryosurgery, zap it with electricity and Laser Treatment. Laser treatment is one of the easiest ways to get rid of this condition. Our machine uses a pulsed laser to destroy the lesion and burn it off. Depending on how many lesions you have, there may be need for more than one session. This treatment may cause bruising which will last up to 10 days. Visit our Mississauga skin clinic to discuss if Cherry Angioma removal is the right service for you.